Only Watch, the grand Monaco event for devotees of fine watches, will take place on September 28th 2013. Under the patronage of HSH Prince Albert II, President of Honour of the Monaco Watchmaking Circle, this exhibition and auction will present creations from 38 of the world’s most prestigious watch brands, including a one-of-a-kind creation developed for this special occasion by Laurent Ferrier. Inspired by expertise dating back over 200 years, the Galet Classic Only Watch also incorporates avant-garde technology ensuring exceptional precision. It is equipped with a tourbillon device imagined by Abraham-Louis Breguet in 1801, and complemented by two head-to-tail mounted balance-springs in the centre of the balance. The main advantage of this construction developed by Laurent Ferrier is to maintain the centre of the balance firmly on its axis, while compensating for the effects of gravity. This approach guarantees the extreme reliability of the regulating system. Laurent Ferrier worked for a full 15 months on the new version of the initial calibre introduced in 2010. In this 2013 edition, while the general principle with its proven performances remains unaltered, the technology has been improved, while the construction has been reinterpreted and subtly fine-tuned. As with any competitive mechanism, performances are determined by a wealth of tiny details. In addition to enhancing performance, Laurent Ferrier is keen to control the production of the regulating organ entirely in-house in order to maintain this expertise within the four walls of its workshops. The Tourbillon Double Spiral calibre thus now appears in a “second”, even more accomplished version of which the production is entirely handled in-house. The Laurent Ferrier Research and Development (R&D) department has created a new geometry for the lever and the escape-wheel intended to optimise the efficiency of the system. This design, along with the use of steel, further increases the performance of the Swiss lever escapement. The new shape of the lever (patent pending) stems from a reflection on how to improve the position of the two pallets in an optimal manner so as to reduce the security angles in the escapement construction – the goal being to increase the impulse surfaces and thus intensify the system’s efficiency. In terms of automobile imagery, Laurent Ferrier has sought to improve the efficiency of the engine in order to cover a maximum distance with a minimum amount of fuel. This new geometry provides constant support for the lever and serves to achieve optimal values in each position. It reduces the losses of force due to backlash and facilitates the unlocking impulse. Instead of increasing the forces in play in the barrel, Laurent Ferrier pursues its efforts in the same spirit of using existing energy in a more effective way. The famous head-to-tail mounted double balance-spring system has been revisited in a new and more resistant material that will remain confidential and is designed to further enhance regularity. The balance – now exclusive to Laurent Ferrier – has been redesigned in order to perfect its rating precision. The four adjustment screws are in gold to ensure the finest possible adjustment. These resolutely horological modifications represent undeniable assets in drawing ever closer to perfection. Right from the design stage, Laurent Ferrier seeks to counteract the phenomenon of irregularity inherent in each movement given that the barrel spring, between the time of winding and the end of the power reserve, delivery an energy flow that steadily diminishes as it is discharged. These differences interfere with the regularity of rate of the watch, meaning its precision. 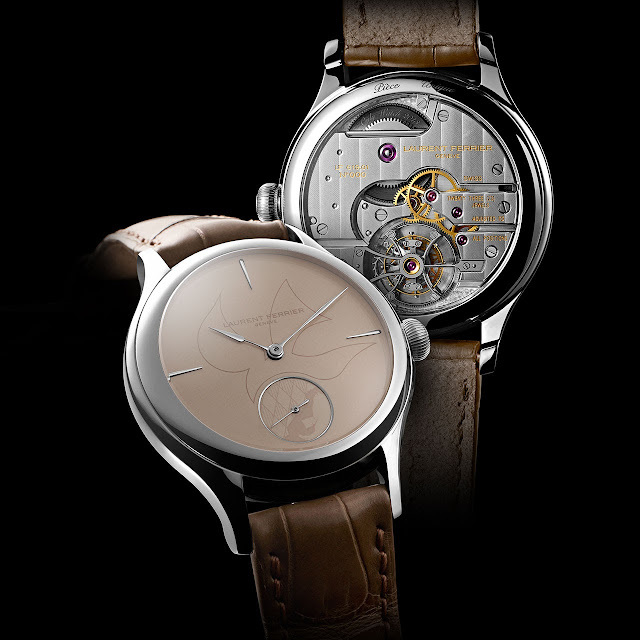 In association with the tourbillon mechanism, with suitably adapted construction and materials, as well as manual rating of the escapement, the regulating organ maintains its equilibrium in the various positions and thus delivers excellent rating accuracy – in turn ensuring optimal timing precision. What could be more symbolic than a dove to demonstrate support and loyalty to a cause as essential as that of scientific research? The new Galet Classic Only Watch features a unique dial created and designed by Laurent Ferrier. On an 18K gold plate, a sand-coloured grand feu enamel dial provides a tone-on-tone depiction of a dainty and infinitely pure dial designed in one smooth stroke. This ethereal symbol of love and peace embraces the small seconds at 6 o’clock bearing the Monaco coat-of-arms and its geography – all exquisitely crafted by hand. The “assegai-shaped” gold hour and minute hands and the baton-shaped seconds hand lend the perfect finishing touch. The dial remains perfectly readable thanks to the graphic arrangement of the “teardrop” applied gold hour-markers and the gold decorative fillet surrounding the counter. The curve of the steel case reflects the brand’s pure, restrained design codes. It adopts the shape of a pebble (galet in French) in a nod to the large and refined historical watch models. It is equipped with a ball-shaped winding-crown ensuring more pleasant handling. The snap-on case-back makes the movement more accessible to the watchmaker via the olivette. Its water-resistance is guarantee to a depth of 30 metres.